If Central Kentucky is the horse capital of the world, Midway is the heart and soul of the horse industry in Kentucky. Horse farms hem the town in on all sides. Along the main street you can buy saddles, harnesses, riding gear, paintings and anything else related to the thoroughbred industry. At Midway College you can major in various equine fields. The town is one of those Norman Rockwell gems where everyone wishes they could have grown up. 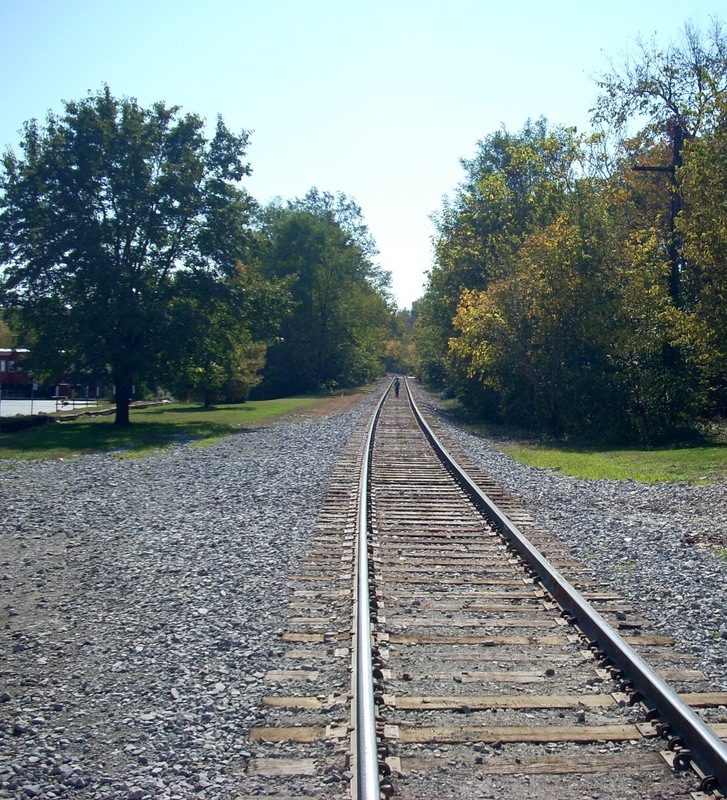 Because it is midway between Lexington and Frankfort, it was an early train stop, hence the name, and railroad culture rivals the horse culture. 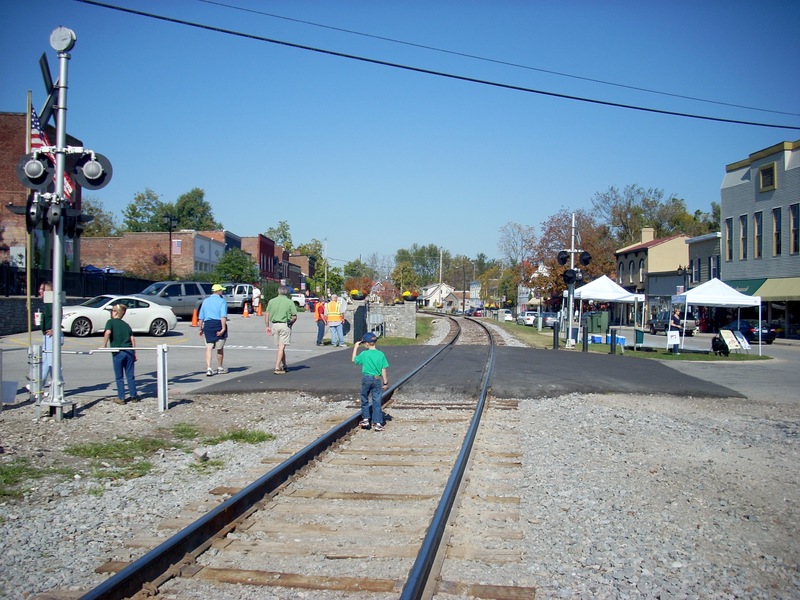 The track runs right down the center of town, with its own landscaped right of way. Pessenger trains no longer stop here, and the old station (above left) is now the bank. But freight trains still rumble through several times a day, and the Lexington based R. J. Corman Company has breathed new life into the single track route. Midway's main street has become a destination for visitors from Lexington, Louisville and Cincinnati. They come for the antique shops, art galleries, clothing boutiques and various special events. But most of all they come for the restaurants. 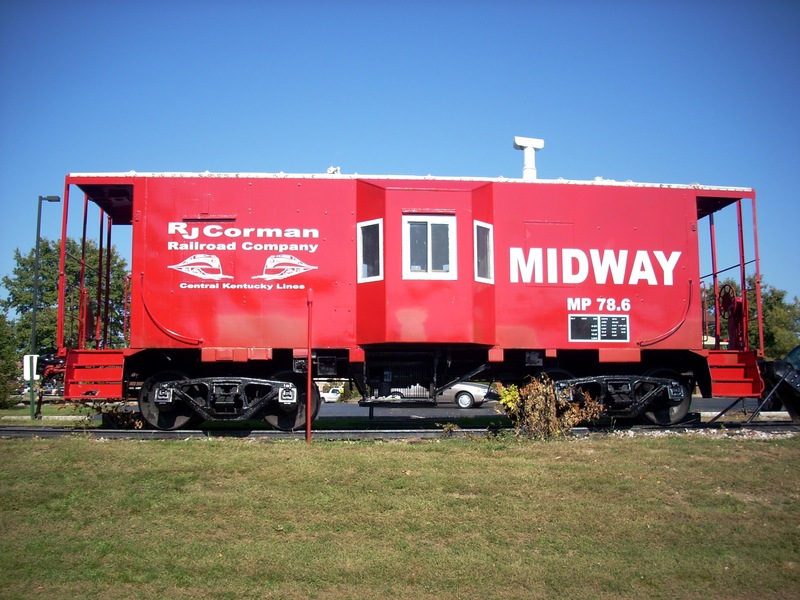 Midway is home to six outstanding restaurants, any one of which justifies the drive. Many foodies come here every Friday night year round, taking turns on which restaurant they visit. The crown jewel of the Midway collection is Holly Hill Inn, an 1812 antebellum mansion on a hill outside town. Most conneisseuers rate it the best restaurant in Kentucky. Ouita and husband Chris Michel are chef and sommelier. They use fresh, locally grown ingredients in a fixed menu of three, four or five courses at $35, $40 or $45. Their halibut and scallops are wonderful, but when available, the rabbit and squab are the stars of the entree show. Make sure the cornbread accompanies whatever you order. And while you can order your own wine, we suggest you let Chris choose one for you. Save room for dessert; Ouita's are special. Midway. 859-846-4732. From the I-64 exit, turn right on 421 and immediately turn left on North Winter Street. 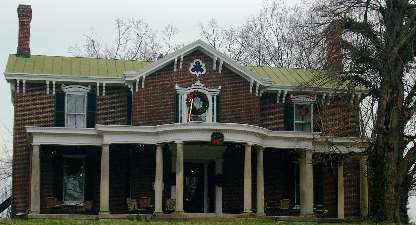 Holly Hill Inn is at 426, a block up the hill. 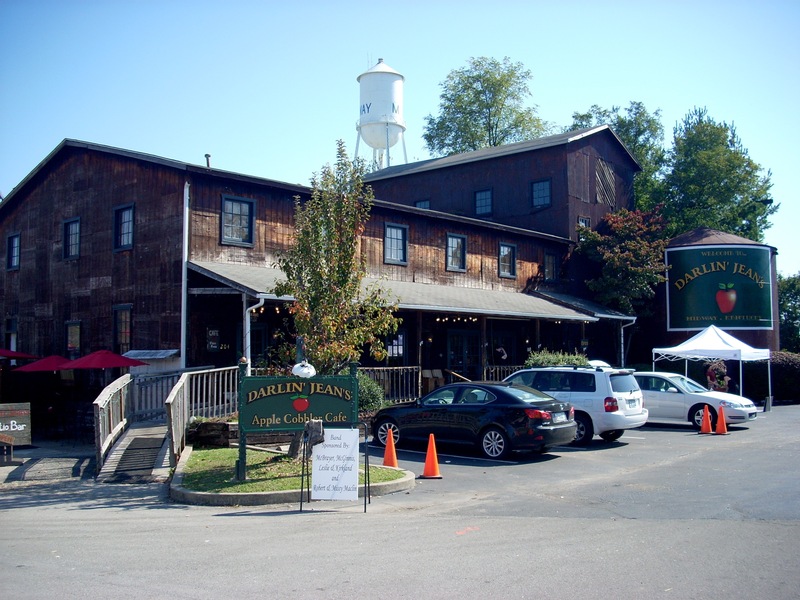 Along Main Street, Darlin Jean's is the largest and most prominent, occupying the former freight station next to the passenger depot. Hot Brown is a Kentucky art form, and if you're a Hot Brown lover, you have to eat here, because this is probably the best Hot Brown in the state. The smoked turkey, ham and cheese are baked in a casserole dish. Not only is it delicious, but there's so much of it you can take enough home for lunch the next day. The Baked Potato Casserole is one of the best sides in the state. It's almost a lunch by itself, but as a dinner side it works well with every entree. Salads are large, fresh and tasty, and the Spinach Dip is excellent. Among the entrees, their Tilapia and various kinds of Chicken are good, as is the Steak. In the Winter they offer Soups. The other specialty here is the Cobbler. You can choose from Apple, Peach, Blackberry and whatever other fruits are in season. The Cobblers are so good many frequent Midway visitors eat dinner at other restaurants and then come to Darlin Jean's for dessert. 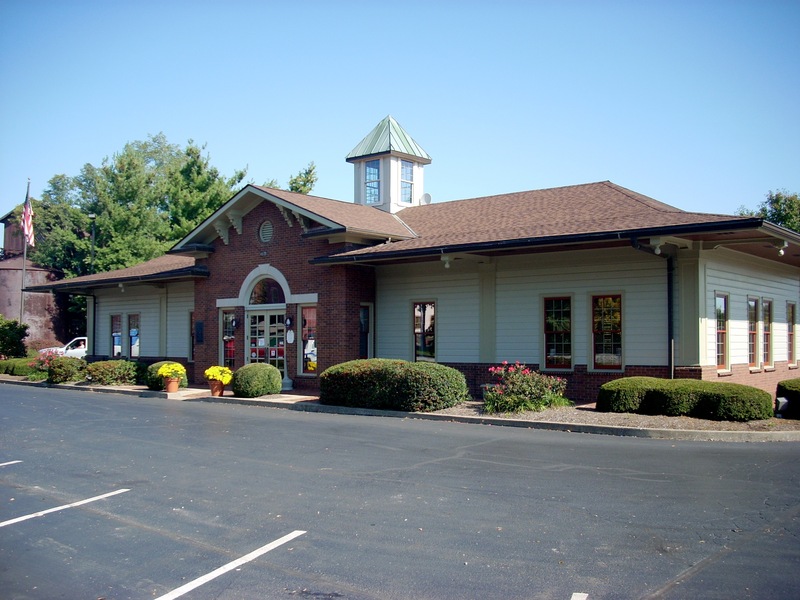 If you come on weekends be aware the central location and big parking lot make Darlin Jean's the social center of town. There's live music on Friday nights and other events on Saturdays. In this photo, the white tent is the registration point for the annual Bourbon Chase, a marathon. The Grey Goose has a limited menu, mostly "bar food," but what they serve is good. Their main entree is the Ribeye. Beyond that, they offer seven appetizers, the best of which are the Fried Cheddar Broccoli Bites and Mini Corn Dogs. They serve a good Salad (Spinach, Garden or Iceberg). There are four Sandwiches : Chargrilled Chicken, Black Bean Burger, Gooseburger, and Kentucky Ale Bourbon Barrel Beer Battered Cod. Locals usually drop by for the Cod without the bread. They take pride in their Pizza, hand rolling it New York style with thin crust, mild tomato sauce, and premium Wisconsin whole milk Mozzarella Cheese. They offer some creative versions : Fried Egg Pizza, Bleu Cheese Pizza and Hot Brown Pizza. 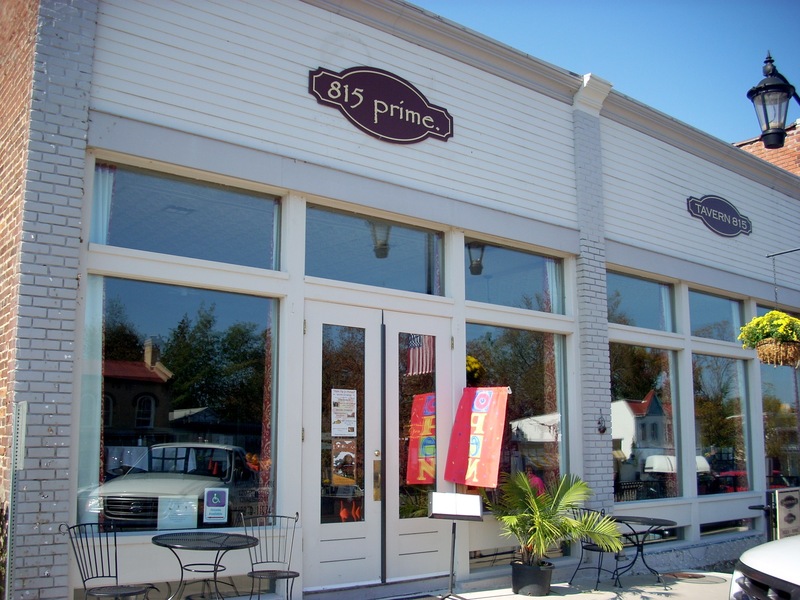 815 Prime serves Brunch, Lunch and Dinner. The Brunch menu offers such items as Raspberry Lemon Muffins, Frittata, Eggs Benedict, Fried Green Tomatoes, Steak & Eggs, Buttermilk Blueberry Pancakes and a Quiche of the Day. At Lunch they have a Soup of the Day, Mussels in Coconut Lime Broth and Lemongrass, and a House Salad including cucumber, black olives, avocado, idiazabel and red onion. For Dinner you can try Seared Scallops, Slow Roasted King Salmon, Grilled Ribeye and Linguine with herb roasted chicken, pesto, green beans and cherry tomato comfit. We particularly like their Scallops, which come with grilled leeks, weisenberger mill (the local gristmill) white grits and a chorizo vinaigrette. There's an upscale bar downstairs and a patio out back. 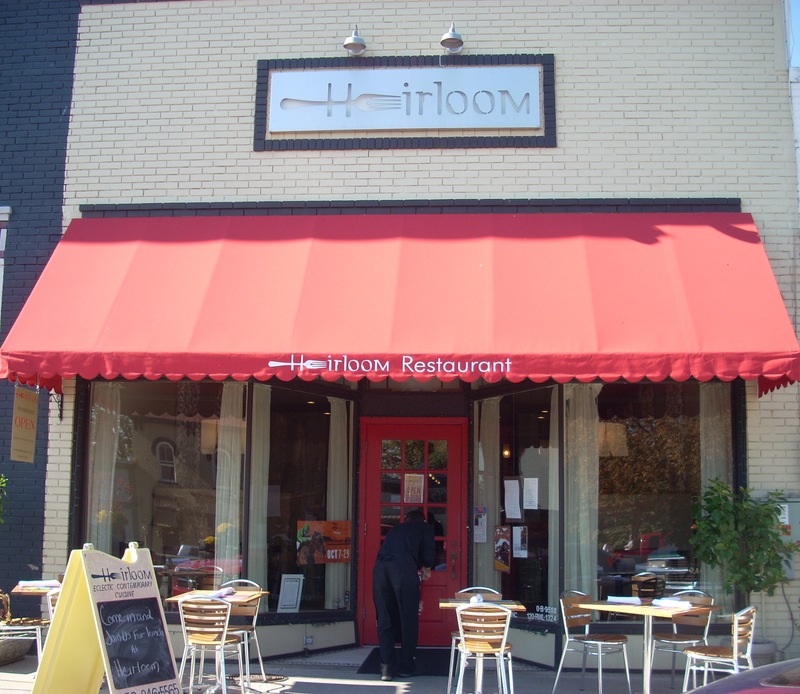 Heirloom serves lunch and dinner. The lunch menu includes a very good Crab Cake Sandwich (with a unique jalapeno slaw), Chicken Livers in Ricotta Ravioli, and the famous Mary Burger, supposedly one of Kentucky's outstanding gourmet burgers. We're not real big on Chicken Livers, but we have to admit these are probably the best we've ever tasted. There are also Buttermilk Brine Fried Chicken, Chicken Mushroom Crepes and a Bahn Mi Steak Sandwich. But it's at Dinner where Heirloom shines. You're tempted to eat here every night for a week to try all the different items. For starters, the Spiced Walnut Gazpacho with Manchego is surely one of the more creative soups in Kentucky, just as the Strawberry Mache with maytag blue cheese, candied pecans, cracked pepper and balsamic is one of its best Salads. The Sauteed Chicken Livers, Tempura of Halibut (in creamy spicy yuzu sauce, scallions and watermelon radishes), Crab Cake (with sweet corn veloute, avocado, corn cotija salad and sriracha honey) and Oysters are listed as "enticements," and almost prevent you from getting to the actual entrees. They include Chili Roast Tiger Prawns, Alaskan King Crab, Pan Seared Halibut, Duck, and Buttermilk Poached Chicken. 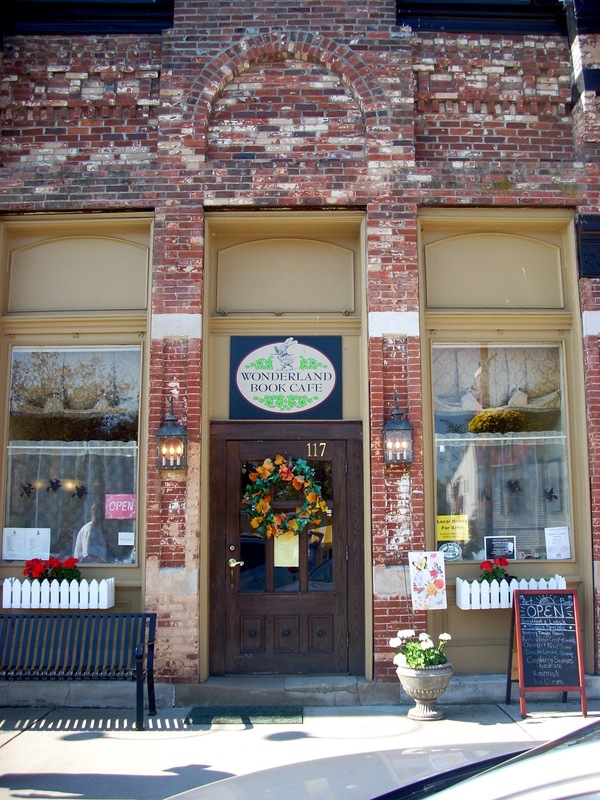 The Wonderland Book Cafe is a book lover's dining nook. There are full sized cardboard cutouts of Harry Potter and other literary figures and shelves of books all around. But there is also good eating here. They serve Breakfast and Lunch. At breakfast you can sample Belgian Waffles, Yogurt Parfait, Chocolate Hazelnut Panini and Fruit and Nut Oatmeal. And, of course, there are various breads and eggs. Lunch offers a Cheese Quesadilla, Ham & Cheese Panini, Meatloaf Sandwich, Soup of the Day and Dessert of the Day. There are various sandwiches, all served with corn chips. 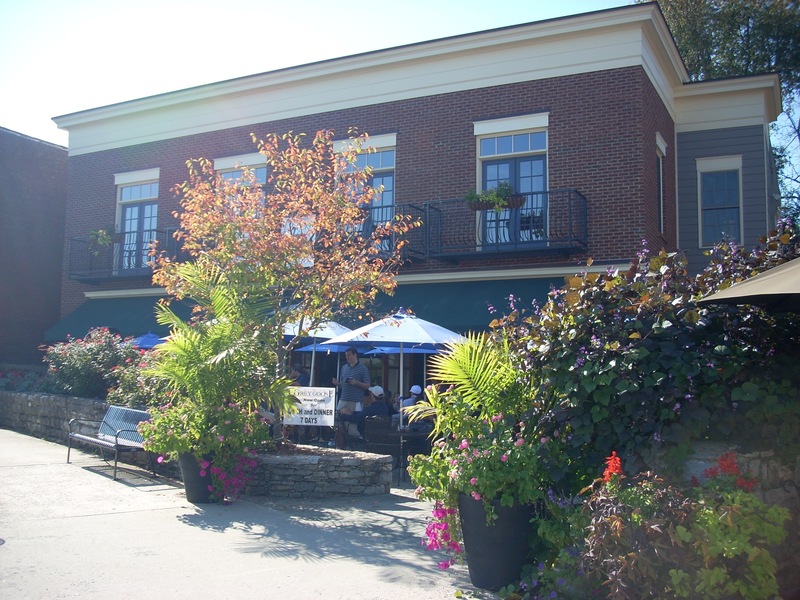 The Strawberry Lemonade and the Elmwood Inn Hot Tea are both good. A few words of caution. As you can imagine from reading these menus, these are cutting edge restaurants which attract a loyal following. If you come to Midway to eat on a Friday or Saturday night, come early. By 6:30 on you will have up to an hour wait. And there's another problem. From 4:30 - 6:00 five nights a week, Leestown Road coming out of Lexington will be backed up by traffic. If you're coming at that time, use the interstate. Any other time, Leestown Road is a very pleasant drive.